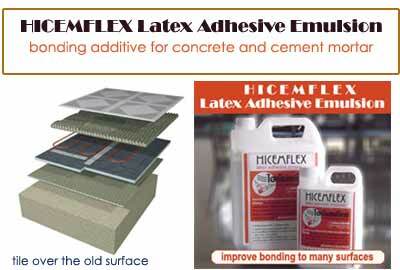 Hicemflex Latex Adhesive Emulsion is designed for use as an additive for cement/concrete mixes to improve adhesion and mechanical properties.Suitable for exterior and interior use; hard, tough, fast curing and posses good resistance to most common chemical. Displays excellent flexibility, defomability and high adhesion to many surfaces.Hicemflex Latex Adhesive Emulsion is particularly adaptable for redecoration (new tile application) over old concrete or old tile work without removal requirement. It is also modified for mixing in clay for ceramic or porcelain setting.Application special design, maintenance, renovation or structural modification that needs high-bonding result. (a) Combine cement and dry sand together: one(1) part cement to three (3) parts sand. Set aside. (b) Mix one(1) part Hicemflex latex adhesive emulsion with three (3) parts pure water. (c) Combine (a+b) the cement-sand mixture with the adhesive emulsion mixture in a ratio of three (3) parts cement to one (1) part emulsion.3.Using a trowel, apply the mixture evenly over the working surface to a thickness of 10-15 mm.at least. Redecorate over the old tile1. Brush Hicemflex latex adhesive emulsion onto the old tile or concrete surface and allow it to dry for at least 60 minutes or until white latex texture appears clear. (c) Combine (a+b) the cement-sand mixture with the adhesive emulsion mixture in a ratio of three (3) parts cement to one (1) part emulsion.3.Using a trowel, apply the mixture evenly over the working surface to a thickness of approximately 3-5 mm. 4. Press the tile firmly into the cement mortar insuring the tile is fully attached with exceptionally large tiles. 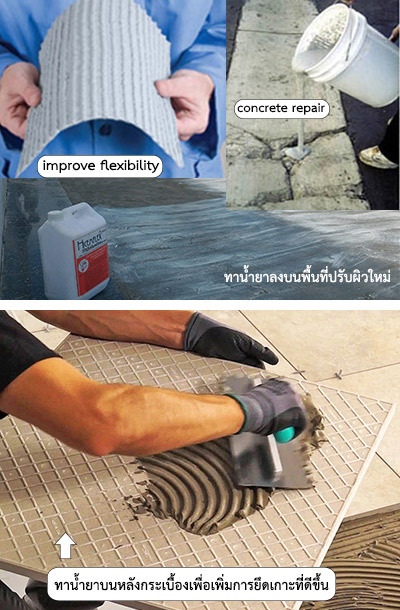 It is recommended that the cement mortar be equally applied to the back of the tile to insure supplement bonding. special design :-Integral special design enhances the beauty of your project and increases property value. Hicemflex latex adhesive emulsion is simply upgrade ordinary work in such an easy direction. 1.To attach materials onto any kind of substrates such as concrete/mortar, glass, wood, gypsum, PVC or others. First step is to coat Hicemflex latex adhesive emulsion on its surface the same as describe above (concrete maintenance and redecoration direction). Leave it about 20-30 mins. 2. Put mortar which is already mixed with emulsion on the substrates. 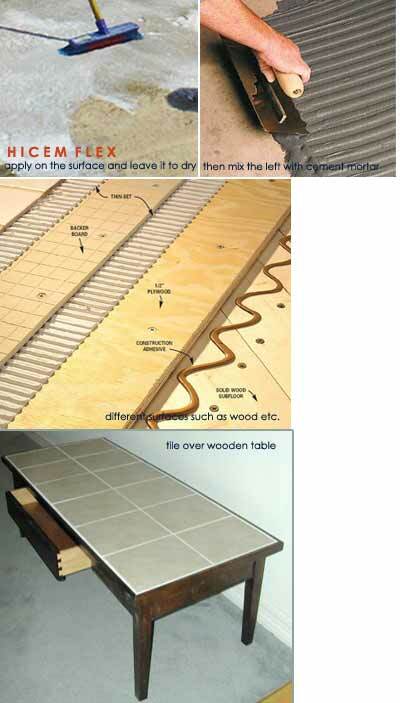 Be sure that mortar thickness is proper to the attached materials' size and should not less than 5 -10 mm. 3. Press the materials into mortar texture. 4. Arrange as desire.Thin plaster :-To plaster on wall, foundation pile or other surfaces that thin-layer is required. Achievement is possible by Hicemflex emulsion mixes with Portland-sand combination. This is also given good performance in long period of time.